One of the great films from French director Maurice Pialat makes its DVD debut courtesy of The Criterion Collection, and it sure looks like a disc that's more than worth owning. 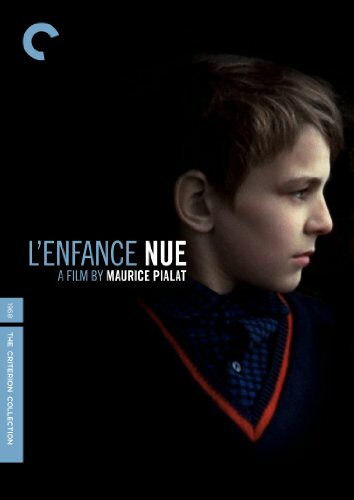 The late French director Maurice Pialat (Van Gogh) began his career back in 1968 with his first feature film, L�enfance Nue. Translated to English as Naked Childhood, this film tells the story of one boy who was bounced around from foster home to foster home throughout rural France. At the time, Pialat mostly dabbled in documentary filmmaking, and his first feature is fiction, but it�s central themes don�t exactly stray from his non- fiction roots. What his debut does do is focus on subject matter that is still at least slightly taboo throughout the world, especially when it deals with children similar to this protagonist, making L�enfance Nue just as effective and important now as it was over 40 years ago. The Criterion Collection emphasizes its importance by granting it another one of their signature excellent releases, but, unlike many of their recent efforts, the film is only offered in the standard DVD format. Fortunately, thinks look and sound just fine here, and there�s also a solid extras collection as well. Fran�ois Fournier (Michel Terrazon) is a young boy on the verge of making yet another transition from one foster family to another. During the social worker�s latest meeting with his current family, the Joigny's, they informed this man that they are actually terrified of Fran�ois, fearing the next harmful thing he will do to them. Upon hearing this, Fran�ois, is, indeed, moved to the next family, the Thierry�s, an elderly couple who seem to be much more nurturing and accepting of Fran�ois, despite his shortcomings and destructive tendencies. He also becomes close with Mrs. Thierry�s mother, Nana (Marie Marc), who steers Fran�ois on a straight and narrow path, opening others� eyes to the fact that there�s more to him than just a juvenile delinquent. This is the epitome of a short, briskly-paced little film. However, Maurice Pialat has an awful lot to say in such a short period of time. He is clearly not happy with the foster care system in that they seem to be treating Fran�ois as a thing rather than a human being. Sure, he doesn�t exactly make things easy on himself by consistently doing the wrong thing and committing criminal acts, but it can be argued that he would be a better kid if he�d been treated with more care from the get-go by the numerous adults he�s been shuffled back and forth between. Pialat wastes no time in showing us the Joigny�s disgust with Fran�ois, and their willingness to just throw him away like garbage is truly harrowing stuff. Still, this isn�t a filmmaker with a ridiculous political agenda or anything even remotely close, as he shows us how the foster care system can work to benefit both children and adults, and he does this by introducing us to the Thierry�s. In the 40+ years since the release of L�enfance Nue, it�s remained true that this is a system that will never be totally fixed, but, as expressed in the film, if enough good people participated in these programs, it�s a system that could get pretty close to being a damn good one, at least in some parts of the world. The performances, are good ones, across the board, but this is clearly young Michel Terrazon�s film to carry. While his acting career only consisted of appearances in four films, L�enfance Nue was his first, and, given his amazing work in it, you�d think he�d been in numerous before it. His ability to flawlessly carry the film, in what is a nearly dialogue-free performance, is simply uncanny, and single-handedly takes Pialat�s film to another level. The rest of the performers are quite good as well, led by Marie Marc as Nana. She does a superb job in a role that, in a lesser film, would have been relegated to a token, old, useless grandmother role. Here, she�s an integral part of the story, and, more importantly, Pialat�s vision. There�s little surprise that Criterion has delivered yet another excellent DVD for a relatively obscure film. A new video transfer and clean audio mix are only the tip of the iceberg, as they�ve also included another great booklet, as well as excellent documentary and interview pieces in the extras department.